The idea came from my good friend who has been making a version of these on a regular basis in her house. She can make a double batch and then have them disappear within days. Not too long ago I decided I would come up with my own version of these (mainly because I could not get a hold of her to get her recipe on the day that I had planned on making them). So…I had to improvise. I am not sure what she will think of my version compared to hers, but at least my kiddos made an official call that these rock – especially because they can make them completely by themselves. We have made them three more times since the original batch, and they are a coveted treat once the boys roll in after school. They are a power-packed snack and go a long way in holding over the kids to get them through that “witching hour” after school. And they definitely rank up there at the top of our list, along with our other favorite healthy treat, the Gluten-Free Oatmeal Granola Cookie Bars. They boast a punch of protein, a hit of Omegas, and are totally nutrient dense. They are naturally gluten-free, dairy-free, egg-free, soy-free, and nut-free (though you can easily add nuts to these too). They are also raw. For a treat that takes only 5 minutes to throw together, you really can’t go wrong by keeping these stashed in the fridge for a quick and healthy snack! 1. In large bowl, combine Oats, Ground Chia, Hemp Seeds, Cacao Powder, Cinnamon, and Sea Salt. Add in Sunflower-Seed Butter, Maple Syrup, Vanilla, and Mix-Ins. Mix until just combined. 2. Line a baking sheet with parchment paper. Scoop 1 Tbsp of mixture and roll between hands into ball. Place on cookie sheet. Repeat until all the mixture is used. Depending on the size, this should make about 20-30 balls. 3. Place cookie sheet in refrigerator for about 30 minutes to set. Once chilled, store in airtight container in refrigerator for up to 1 week. 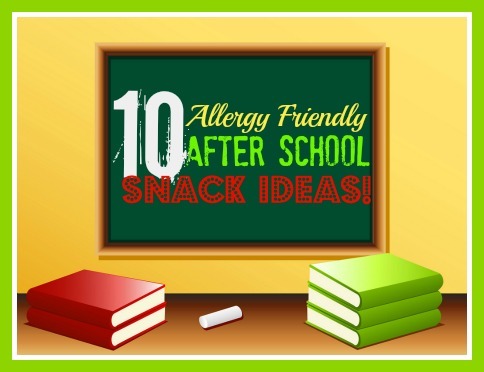 And for my list of 10 Allergy-Friendly After School Snack Ideas, go check out my post on The Balanced Platter today to find even more ways to beat that dreaded “witching hour”. What is your favorite after school snack? Do you have any new ideas for me? Kim! I have a challenge for you. As a type 1 diabetic I always need to carry around sugar and snacks in case my blood sugar goes low. I’ve been buying the Enjoy Life bars but they’re getting expensive! It’s also hard to find a GF/DF granola bar that is only about 15 carbs and not too high in fat (these are just to treat lows after all, I want as few calories as possible. My challenge is to create a similar product to either a Quaker Chewy bar or the Enjoy life bars. (I used to use the Clif Kidz bars but those too, sometimes make me feel weird as they aren’t totally GF). Do you think you could do it? Or help me figure out a way to make some? I’d be really grateful! Oh, Kim, these little bites are awesome! I’m not eating chia seed these days, but I could certainly skip that or use some finely ground nuts (or almond flour). 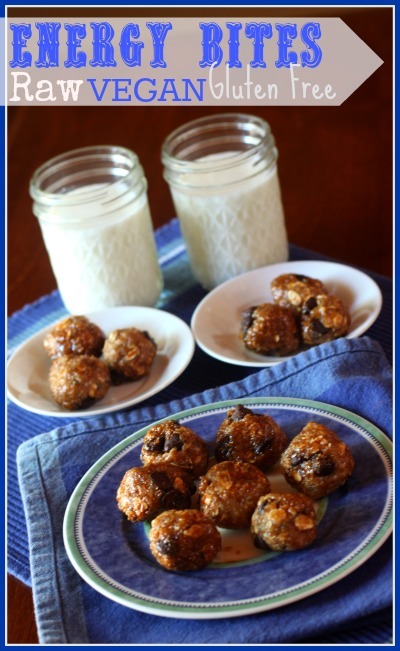 I might try these with quinoa flakes instead of oats or oat flour since I don’t have oats on hand. 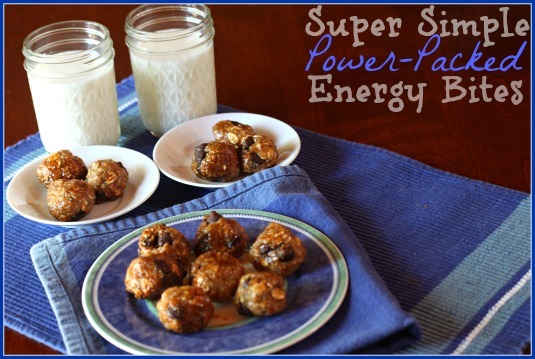 Anyway, total near-instant yum, and great post over at TBP! If you are allergic to cinnamon, what would be a good substitute? Or can you just leave it out? I made these with combined buckweat-, rice-, millet- and quinoaflakes and ricesyrup and left out the maple syrup and cocoa and quess what? They are a delight and made them in no time. Maybe trying to form bars, wrap and take away for the road. I think no-bakes are my favorite dessert. They combine ease and just the right amount of sweet. And I’m a sucker for anything like cookie dough. These sound great Kim and i love the healthy additions! These are perfect! I need to start doing the power bites for the boys. I made peanut butter granola bars the other day and they were perfect for a quick snack or breakfast. I’m definitely trying these out for my hungry guys! These sound REALLY good! Especially with sunflower butter! So yummy, Kim! And perfect for snacks and lunch boxes, too. I always love the options you give your readers in the recipe. I’ve made these a couple times so far and the family (especially my hubby) loves them. Because my two boys cannot have oats (not even the certified gluten-free ones), I substituted Erewhon Crispy Brown Rice Cereal. You can use any rice cereal, I’m sure, but we prefer this brand because it’s gluten-free, organic, and has no sweetener or preservatives. The cereal adds a great crunch! I did add just a bit more honey and nut butter (used mostly sunbutter, with a little almond butter thrown in) to make it all stick together well enough to roll into balls.